"In the same horror noir as David Lynch's masterpieces. This movies undoubtedly is one of Nicholas Cages most finest of works. 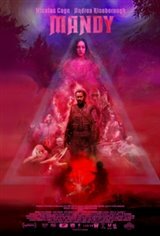 Its a psychedelic horrifying look into what we describe as pure evil when Mandy runs into Jeremiah and his demonic cult followers ! Its Hellraiser-esq smart with fantastic sinister acting from the entire cast that makes us think twice about who we gaze upon by chance when we are out wondering in the world ! The soundtrack is haunting and beautifully composed by the late great Johann Johannson (Sicario). A must see 5 star ride into Hell !" "Was an awesome movie! Probably one of Nicholas Cages' best movies!! This is going to be the new Rocky Horror Picture Show!! Classic for sure!! Can't wait til Blu-ray comes out end of the month!!" "Nicholas Cage has sunk to a new low. Too bad because he is capable of good work given good projects. It is not the most gory piece ever made as others have suggested. It will make you groan for how bad it is. And the sound level was cranked so high that I had to cover my ears. Making it piercing loud does not make it scarier....just uncomfortable. The most interesting feature was the hypnotic stare from the huge eyes of the female lead."